Eugene Goolagong is a member of the Wiradjuri tribe from New South Wales. 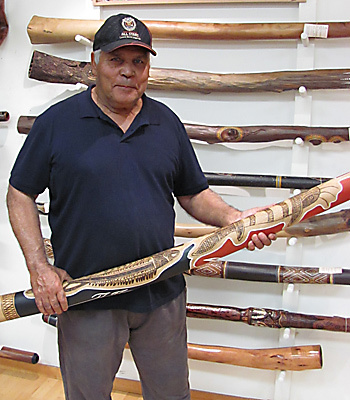 He has been painting and producing didgeridoos for over 25 years. Prior to working exclusively on his craft, Eugene worked as a saw mill operator and builders labourer. Eugene is related to tennis player Yvonne Cawley Goolagong. 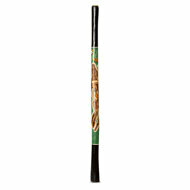 Eugene's artwork is some of the most detailed and intricate artwork we have ever seen on a didgeridoo. He designs images of native flora, fauna and bush tucker into his didgeridoos using a combination of paint and electric burner onto the wood. 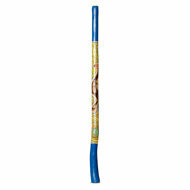 Great sounding instrument with some of the finest artwork available on a didgeridoo. In its final stage it has been hand painted and hand burnt by the artist, and sealed with a gloss finish to protect the artwork, allowing it to be used as both a serious instrument and a piece of art. 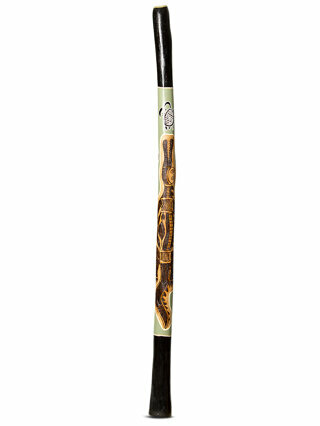 Great affordable genuine Aboriginal termite hollowed eucalyptus didgeridoo!